It is a little-known fact that your windshield plays a critical role in driver and passenger safety. Your windshield provides 34 percent structural integrity of your vehicle. In addition, a correctly installed windshield is essential for the proper deployment of airbags. Your windshield is designed to protect you from the elements. It is, after all, quite difficult to drive when bugs and other debris are bouncing off of your face. It is also true that your windshield endures a lot of punishment. In fact, you can expect windshield damage at some point during the life of your vehicle, it is inevitable and unavoidable. 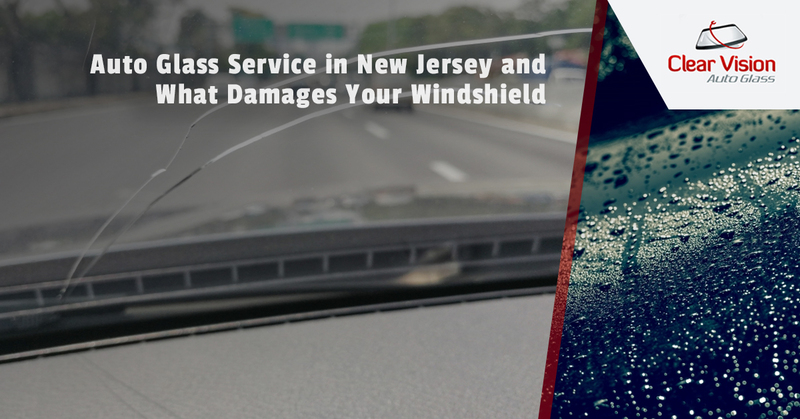 Clear Vision Auto Glass, your auto glass service in New Jersey, offers the most common causes of windshield damage. Accidents and collisions are cause for windshield damage. These can range from traffic accidents involving two or more vehicles, a driver accidentally hitting an animal on the road or a driver losing control of their vehicle in snowy weather and striking a pole. It can also involve baseballs, golf balls and airborne golf clubs. Yes, this does happen. The best way to protect your windshield from this type of damage is to be a safe driver and always be aware of your surroundings. It is also a good idea to park far away from the baseball field and avoid angry golfers. Stress cracks can appear on your windshield if it was not properly installed. You will spot these fractures around the edges of the windscreen, which is prone to cracking. Mind you, they will spread. This is why it is so important to ensure that your windshield is properly installed by an experienced technician using high-quality materials. A rapid change in temperature can cause damage to your windshield. Often, human error is to blame for this. For example, you never want to use boiling water to defrost or deice your windshield. Leaving your car in the hot sun on very hot days can cause damage to the windshield, especially if you get in and crank the air conditioning. High winds are often responsible for flying debris that can damage your windshield. High winds can also knock down tree branches, which will most certainly cause windshield damage. And you can bet that a good hailstorm will cause damage to thousands of windshields in its wake. The best prevention of windshield damage caused by weather is to keep your vehicle parked in a garage. The roads are full of dirt, rocks, pebbles and other debris and it is all too common for it to get kicked up and into your windshield as you cruise down the road. These small and hard projectiles travel at a high rate of speed and the impact will cause a chip or a crack. And while there is not a whole lot you can do to avoid them, it helps when you leave ample space between you and the vehicle in front of you. 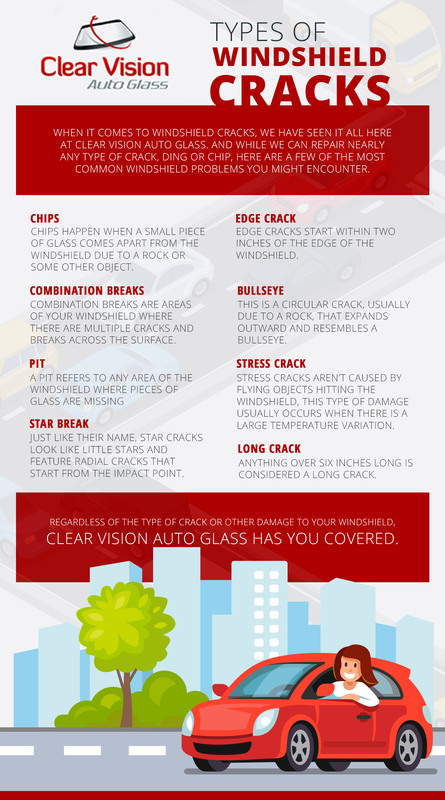 If you have suffered a cracked windshield, give Clear Vision Auto Glass a call.